I wanted to write about this sub-Fender brand not only because it was a great story in its own right, revealing much about how Fender dealt with various kinds of competition through the years, but also because it provided an opportunity to look closely at the sometimes mysterious world of the Japanese guitar industry. Watch a promo video for the book here. Well, actually it’s me yakking about the book for a few minutes, over which someone has stuck some pictures of the book content. In 1982, Fender revived an old guitar-string name for its new line of Japanese-made electric guitars. 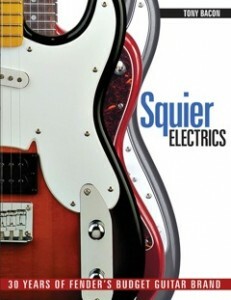 Today, Squier is almost as important to the company as the main Fender brand. I dug up stories behind the original and collectable Japanese-made Squier Series models, the ways in which Fender has often been more adventurous and experimental with Squier, away from its protected main brand, and the famous musicians who chose to play Squier instruments, from Courtney Love and her Venus model to Bollywood’s Ehsaan Noorani and his signature Stratocaster. Click on the link here to read an extract from an interview I did for the book with John 5.